A.F. Palmer Elementary School in Windsor has a reading program for students where the teachers have four legs and a great sense of smell. The canine teachers, Riley and Gracie, are part of the R.E.A.D. program, or Reading Education Assistance Dogs. The program helps students with the stresses that come with growing up and learning how to read and write. Students set goals and get to spend time with Riley and Gracie after achieving their milestones. Riley the black Labrador retriever has been growing up with students since she was 9 weeks old. The program was a hit and Gracie the yellow lab joined the school two years later. 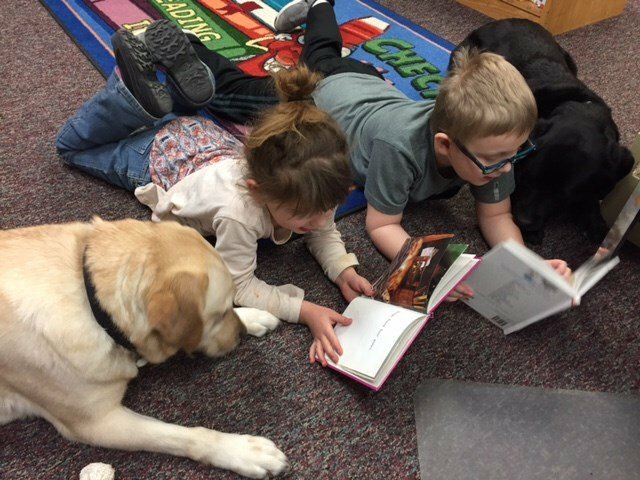 Three times a week you can find the elementary students reading to Riley and Gracie at the library.